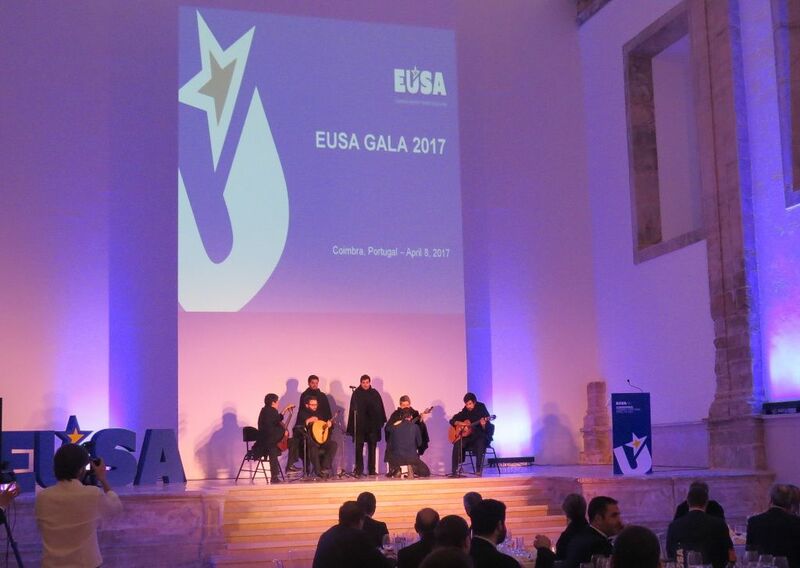 The European University Sports Association (EUSA) concluded EUSA Conference 2017 with a stunning gala packed with local cuisine, music, and dance performances in the Sao Francisco Convent in Coimbra, Portugal on April 8, 2017. 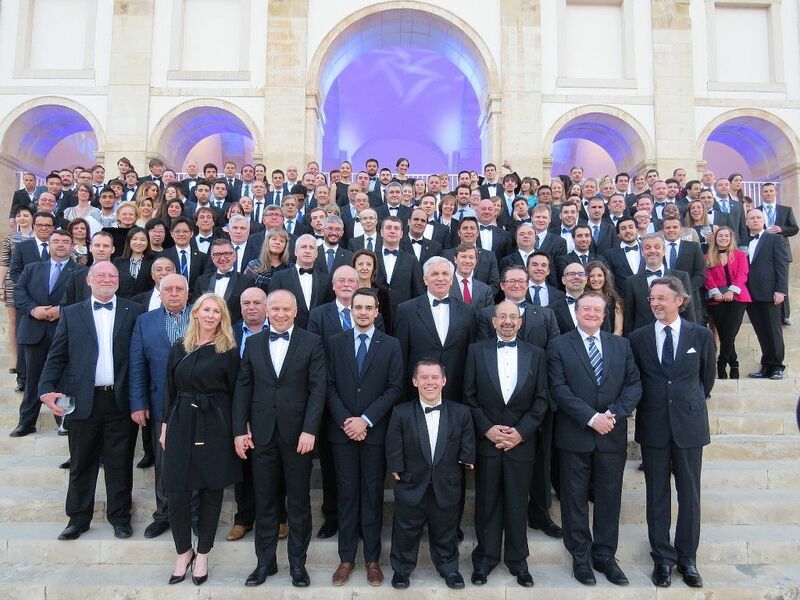 Over invited 200 participants were welcomed into the elegant courtyard of the Sao Francisco Convent, where everyone enjoyed themselves with drinks, canapés, and the tremendous view of Coimbra on the other side of the Mondego River. The event once more had a special blue-tie dress code, a variant of the traditional formal black-tie, incorporating EUSA colours. 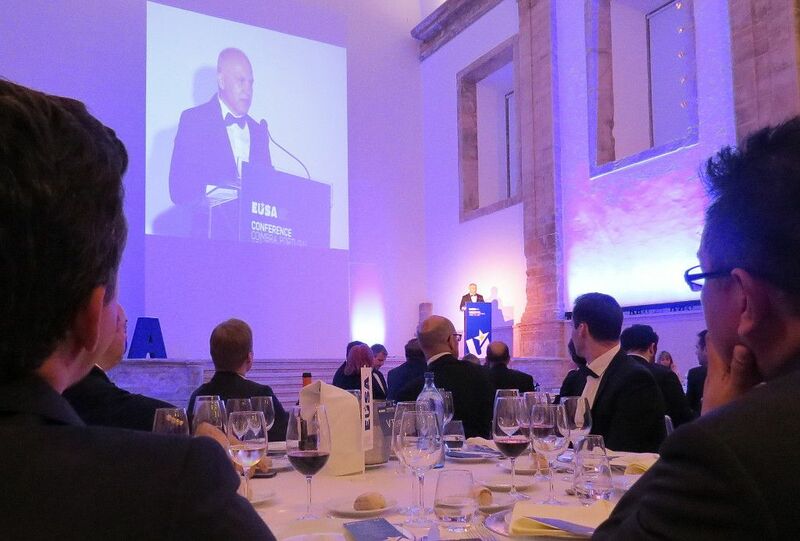 The annual EUSA Gala is dedicated to honouring the achievements, top sports results and continued commitment to European university sport, focusing on the previous year. 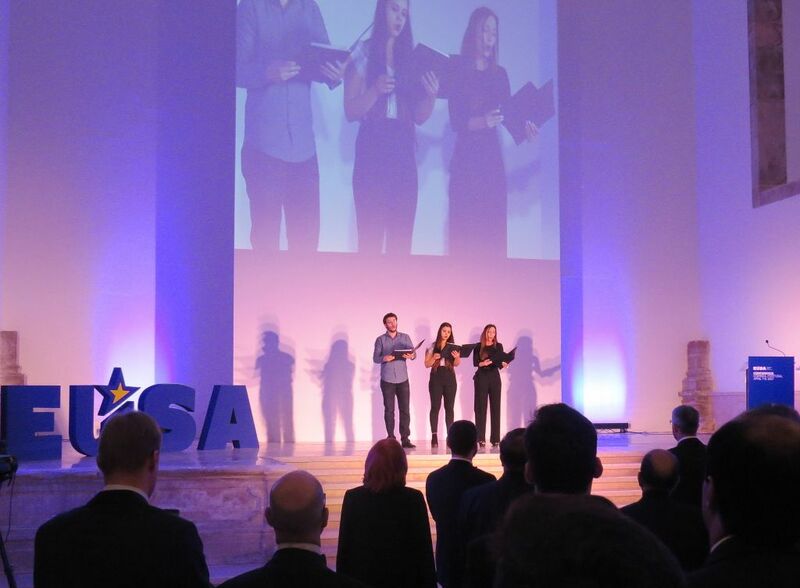 At the beginning, the local musical group Grupo de Solistas were welcome to the stage to perform university sports anthem Gaudeamus Igitur, which received a standing ovation by the gala guests. 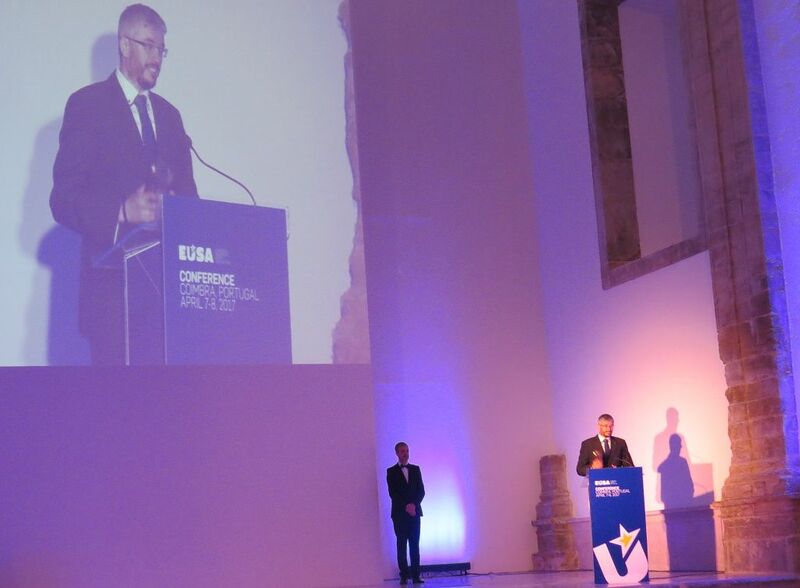 The performance was followed by welcome speeches from EUSA President Mr Adam Roczek, FADU President Mr Daniel Monteiro, and on behalf of the Portuguese Government, the Secretary of State of Youth and Sport Mr Joao Paulo Rebelo. 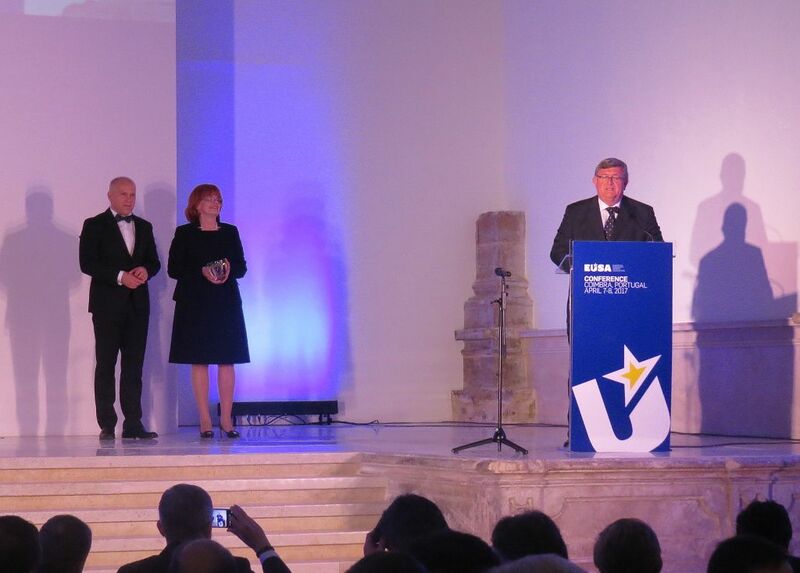 The first award presented was for the most active National University Sports Association, determined by the participation of university teams and the number of participants in EUSA sports events each year; in 2016, this of course relates to the European Universities Games, which were held in Zagreb and Rijeka, Croatia. Due to their huge role in the organisation of the European Universities Games, the Most Active NUSA Award for 2016 is the Croatian Academic Sports Federation - CASF. The award was presented by EUSA Treasurer Mr Lorenz Ursprung, and received by President of the Croatian Academic Sports Federation Mr Zrinko Custonja. The most successful National University Sports Association is determined by the results and final placement of the participants in the European Universities Championships or Games. In 2016 it was the turn of the European Universities Games, where a total of 4,427 male and female student athletes from across Europe competed in Zagreb and Rijeka. 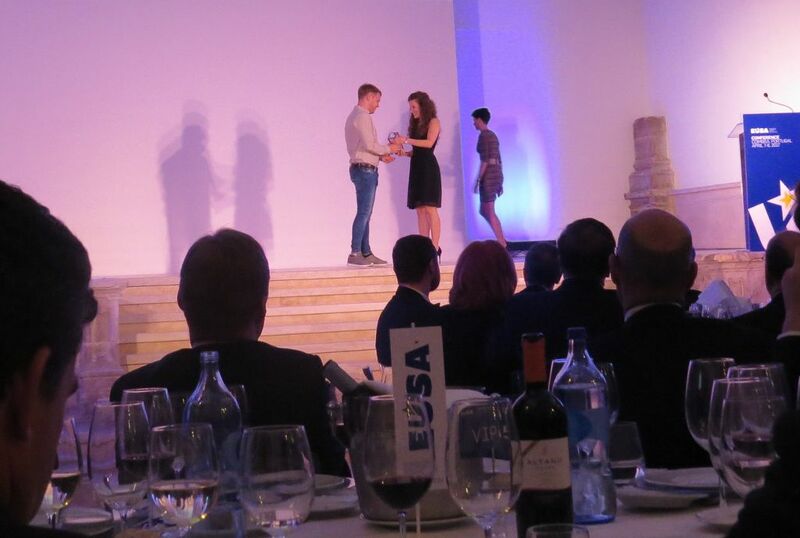 Regarding the results achieved by their university teams at the European Universities Games 2016, the most successful national university sports association in the year 2016 welcomed the Croatian Academic Sports Federation – CASF again to the stage to collect the award. The award was presented by EUSA Secretary General Mr Matjaz Pecovnik, and received by the Vice-President of the Croatian Academic Sports Federation Mr Haris Pavletic. The best university is determined by the sports achievements and results in EUSA competitions. Each team participating in the European Universities Championships or Games gains points for their participation. The final ranking is a sum of all results where additional points are given to the best teams. An amazing total of 388 different universities were represented in the summer of 2016 in Zagreb and Rijeka at the European Universities Games, however there could only be one best university. The Best University Award for 2016 was ultimately given to the University of Zagreb from Croatia. 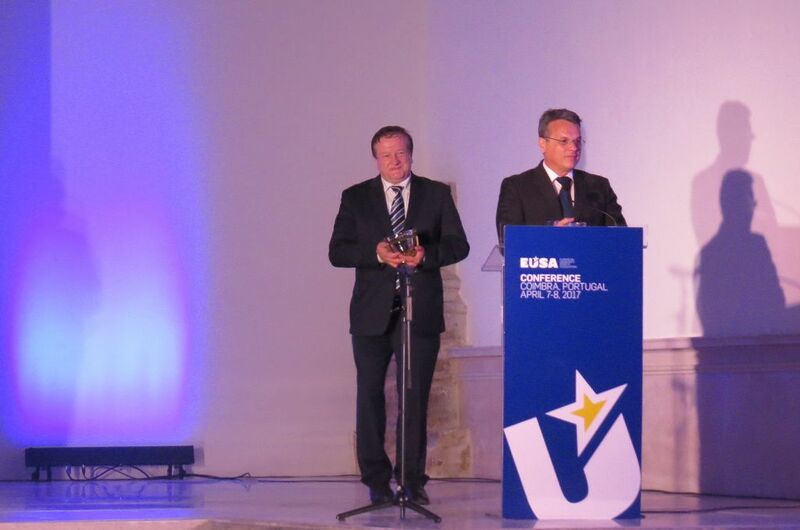 The award was presented by EUSA President, Mr Adam Roczek, and received by Rector of the University of Zagreb Mr Damir Boras. Since 2009, EUSA photo competition has been organised every year through EUSA Student Commission. It gives the chance for participants to take photos and capture the right moment to reveal the true nature of university sporting spirit. From all the photos EUSA received, the Student Commission members choose a total of 10 finalists. The European public is then given their chance to vote through EUSA Facebook page, assisting the decision of the winning photograph. In 2016 the winning photograph was taken during the demonstrative water polo event in Zagreb and Rijeka, and the award was presented to Mr Mikhail Tiuftin from Russia. The award was presented by EUSA Student Commission Chair Ms Anna Edes, and we were grateful to have Mr Mikhail Tiuftin in Portugal to collect his award. Named after the first EUSA President, a person who was very much devoted to fair play, the Enno Harms Fair Play Award annually recognises the greatest act of fair play in EUSA events. In 2016, everyone involved with the European Universities Games could feel the values of EUSA, in particular the values of fair play, mutual respect and inclusion, resulting in truly special atmosphere in Zagreb and Rijeka. For all of the dedicated work of the local and international volunteers, who promoted these values, we were proud to announce the winners of the Enno Harms Fair Play Award 2016 as the EUG2016 Volunteer Team. 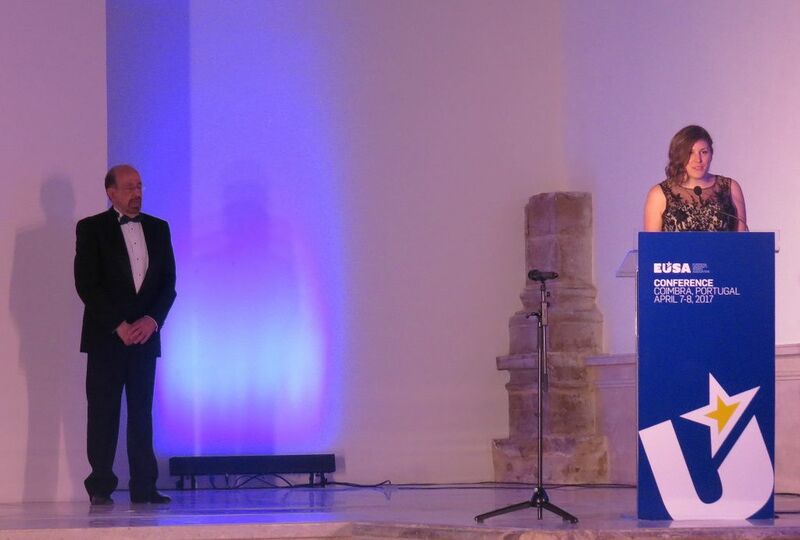 The award was presented by EUSA Honorary President, Mr Alberto Gualtieri, and received by Ms Ivana Anicic on behalf of all the volunteers at EUG2016. For the first time in EUSA history, we succeeded in the full integration of sports for students with disabilities into the European Universities Games, Zagreb and Rijeka 2016. In recent years, cooperation between EUSA and the European Paralympic Committee has grown stronger and stronger, and with European Paralympic Committee’s active involvement we have taken great strides in enabling European students with disabilities compete at the highest level in university sport. We wanted to formally recognise the efforts of the European Paralympic Committee for this contribution, so it was with great pleasure to announce that the special award for 2016 is awarded to the European Paralympic Committee. 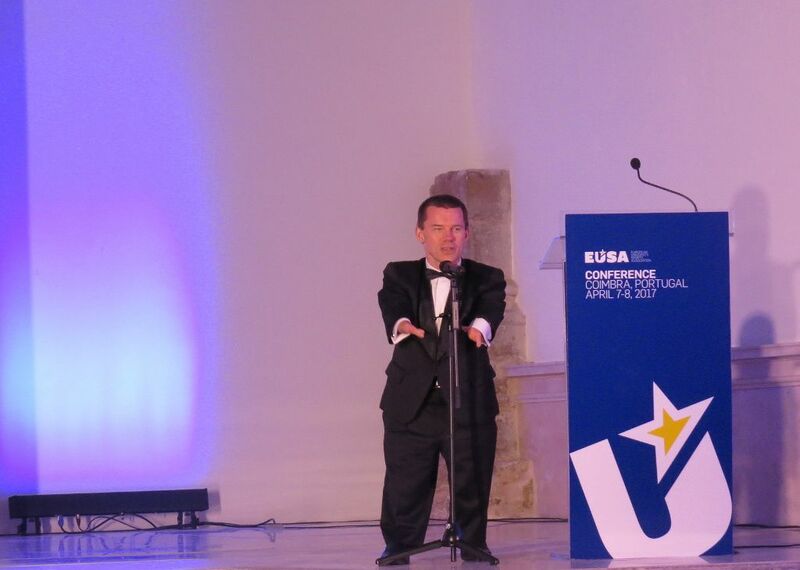 The award was presented by EUSA Vice-President, Mr Haris Pavletic, and received by President of the European Paralympic Committee, Mr John Petersson. The 3rd edition of the European Universities Games, held under the slogan Heart believes – Mind achieves took place in Zagreb and Rijeka in the summer of 2016. It was the greatest and biggest event in EUSA history, with nearly 5,500 participants forming 862 university teams coming from 40 European countries. 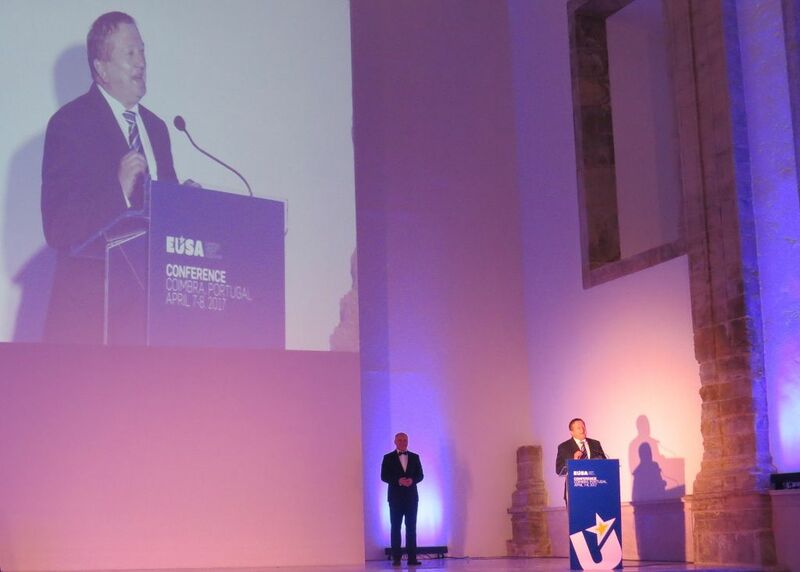 At EUSA Gala 2017, two different Order of Merit awards were presented, recognising the special contributions for the events in Zagreb and Rijeka. The first Order of Merit was in fact given to two institutions, partners from the beginning of the bidding procedure, and are who still working on the affirming the legacy of the games across Croatia. Supporting in all areas of the organisation of the games, from providing university facilities for multiple purposes, to successfully promoting the European universities games across their local areas and beyond. It was with great pleasure to announce that the first Order of Merit award for 2016 goes to the University of Zagreb and the University of Rijeka. The award was presented by EUSA President, Mr Adam Roczek and received by Rector of the University of Zagreb Mr Damir Boras, and Rector of the University of Rijeka Mr Pero Lucin. The second Order of Merit award also had two separate recipients, due to their equal, yet superb, contribution to the organisation of the European universities games 2016. Providing the financial and logistical support needed to create the great event that the games were, we meet these awards recipients with the same gratitude and recognition as the winners of the first order of Merit award. It was with great pleasure to award the second Order of Merit award for 2016 to the City of Zagreb and the City of Rijeka. The award was presented by EUSA President, Mr Adam Roczek and received by Vice-Mayor of the City of Zagreb Ms Vesna Kussin, and the Mayor of the City of Rijeka Mr Vojko Obersnel. The entertainment part of the Gala featured several performances from the Gymnastics Section of the Academic Association of Coimbra in gymnastics and dance, which dazzled the gala guests. To conclude the cultural part of the evening, students from Coimbra performed fado, genre incorporating music and poetry widely practised in Portugal, and has been recognised by UNESCO. 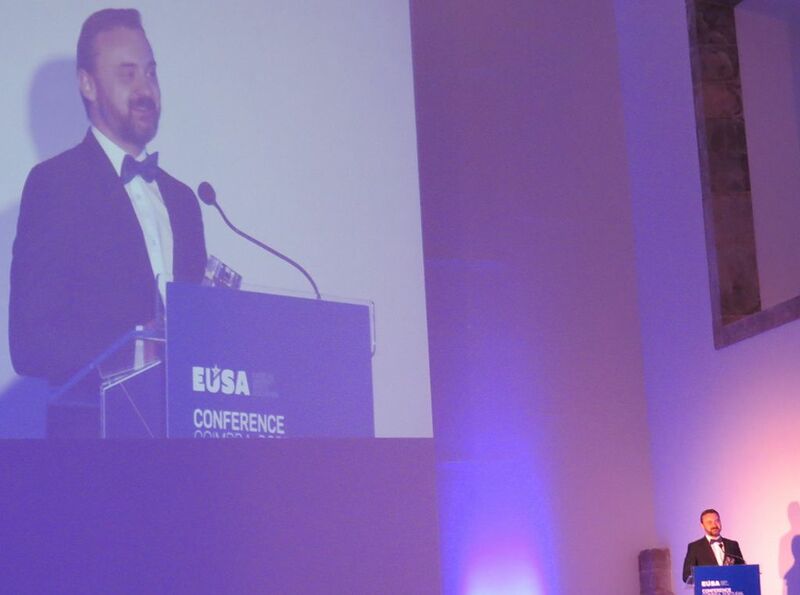 Before the gala host closed the evening, thanking the performers and guests for the presence in what was an amazing evening, EUSA President Mr Adam Roczek thanked FADU President Mr Daniel Monteiro for hosting the event, thanking him and the entire team for their hospitality and cooperation. 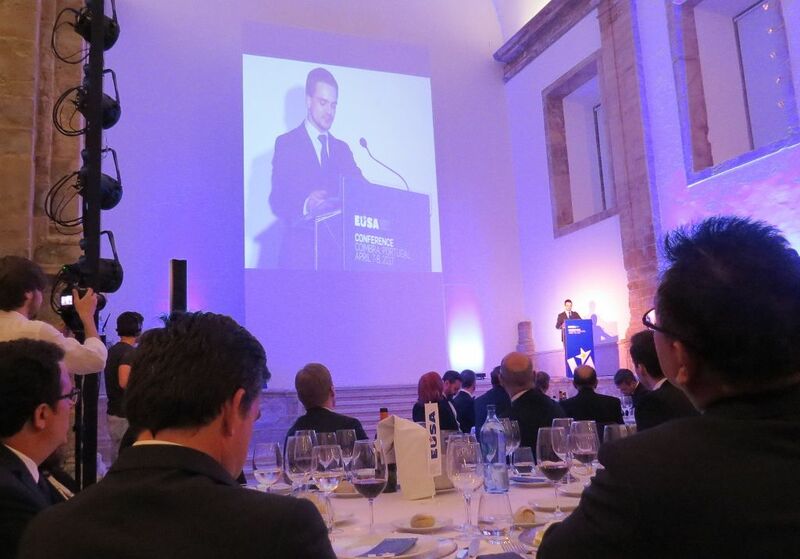 EUSA Gala is also supported by the International University Sports Federation (FISU).